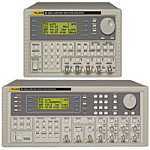 A selection of universal waveform generators offering superior performance and excellent value. These universal waveform generators combine many generators in one instrument. Their extensive signal simulation capabilities include arbitrary waveforms, function generator, pulse/pulse train generator, sweep generator, trigger generator, tone generator, and amplitude modulation source. Standard waveforms include: sine, square, triangle, dc, positive ramp, negative ramp, sine(x)/x, pulse, pulse train, cosine, haversine and havercosine. Output frequency range is 0.1 mHz to 16 MHz for sine and square and up to 100 kHz for triangle, ramps and sine(x)/x. Rise time for pulse is < 25 ns with a period range of 100 ns to 100 s. Output amplitude range can be adjusted from 2.5 mV to 10 V pk-pk into 50 ohm. The 280 series are highly sophisticated 12-bit arbitrary generators capable of recreating virtually any waveform. True variable clock architecture is used with clock speeds between 0.1Hz and 40 MHz. This architecture avoids the clock jitter associated with DDS arbitrary generators and permits waveform linking, looping and sequencing. Waveforms may be defined with up to 4096 vertical points and from 4 to 65,536 horizontal points. Arbitrary waveforms may be replayed at a specified waveform frequency, period or sample rate. Up to 100 user-defined waveforms can be stored within the instruments 256K of nonvolatile memory. Up to sixteen arbitrary waveforms may be linked in a sequence. Each waveform can have a loop count of up to 32,768 and the whole sequence can be run continuously or repeated more than a million times. For multi-channel models, waveforms on different channels can be daisy chained and looped. By summing the channel outputs, up to 64 segments can be used to create highly complex waveforms. Because any channel can be triggered by the previous or next channel, waveforms on different channels can be daisy chained and looped. By summing the channel outputs, up to 64 segments can be used (32 segments for 282). A channel can be used to AM modulate or SCM modulate another channel. Each generator is supplied complete with sophisticated Windows based software for the creation, editing and management of waveforms. This powerful software can be used to create arbitrary waveforms from scratch using drawing tools, equations or both together. Real-world waveforms imported from DSOs or other sources can be modified and combined with other waveforms using editing functions. A library of standard waveforms is included which can be used as elements when creating or modifying waveforms. A powerful Equation Editor provides an array of mathematical functions including logarithmic and geometric operands. Waveform creation and editing can make use of drawing tools in combination with equations, insertion and manipulation. Multiple waveforms can be further combined using mathematical operators to create new waveforms.